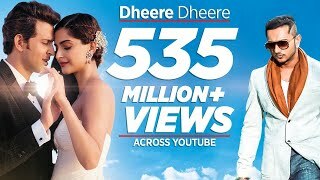 Dheere Dheere Lyrics by Yo Yo Honey Singh: The song is sung, composed and written by Yo! Yo! Honey Singh featuring Hrithik Roshan, Sonam Kapoor. It’s an alternate version of “Dheere Dheere Se” from Aashiqui, composed by Nadeem-Shravan and lyrics by Rani Malik.